BRIGHTON, Mich.- When you think of a vehicle that is loaded with impressive and convenient tech features, the 2013 Ford C-Max probably isn't the first car that comes to mind. However, you may be surprised to discover all of the incredible 2013 Ford C-Max Hybrid Features that will make your time spent on the road even more enjoyable! One of the first 2013 Ford C-Max Features you'll notice are the three color displays that provide plenty of information about your drive. The two 4.2-inch displays, located in the instrument cluster behind the steering wheel, show information about your vehicle such as the gas gauge and fuel economy data, as well as infotainment information like climate control settings or who is on the phone with you. Each screen offers a few different items and views that can be selected using the controls on the steering wheel. One of the items that you can select is the Efficiency Leaves graphic which visually displays how efficiently the vehicle is running based on your driving style. The main 8-inch touchscreen in center stack offers a USB input as well as the option to connect to the internet either through a modem or your Bluetooth-connected phone! The 2013 Ford C-Max also comes equipped with Ford SYNC infotainment technology which includes phone, navigation, entertainment, and climate control, all which can be controlled using voice commands. Optional on the latest C-Max is Ford's SYNC Services which enhances the navigation experience by offering turn-by-turn directions, enhanced graphics of upcoming intersections, traffic information, and the ability to find things for you along the way. A unique feature in the 2013 Ford C-Max is the SYNC Video Player which turns the main 8-inch screen in the center console into a movie theater when the vehicle is parked. 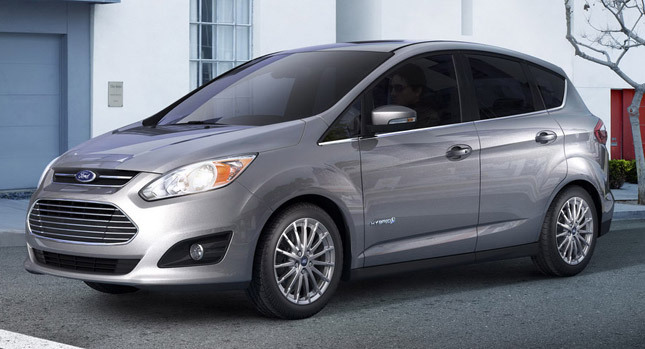 The 2013 Ford C-Max Exterior Features are helpful as well. A rear camera paired with the vehicle's sensing system make backing up a breeze, sounding a faster beep as you get closer to an object behind the vehicle. In addition, the C-Max also features a hands-free liftgate which is activated just by kicking your foot underneath the bumper when you have the key in your pocket or purse. If you want to take advantage of all the latest technology features while enjoying impressive fuel economy, then the 2013 Ford C-Max is perfect for you. Take a look at our downloadable 2013 Ford C-Max Brochure to learn more and keep in mind that we also have Ford C-Max Rebates to help you save some green! Brighton Ford is located at 8240 Grand River Ave. just north of I-96 in Brighton. We are a family owned and operated business that strives on customer satisfaction. For more information on Brighton Ford visit BrightonFord.com or give us a call at (800)-836-8206.